This, thankfully, is a bit more of a complex answer than a simple picture of a can filled with trash. While that is what is depicted below, when compared to the large dorm garbage collection photo from the same prompt in the US it’s a stark contrast. Yes, those bins are full of the trash of some thirty women, but if I’m honest I had a full garbage can of the same size as the one depicted to the left weekly. And this is perhaps because all I do with my used items to be done away with is recycle (very good) and chuck them in the bin. Here in Kotido is an entirely different story, because no material thing can go chucked out without being used to the breaking point. 1. Bottle Collecting: As mentioned in this post, one of our main aims for this summer is to collect enough plastic bottles with which we intend to build a latrine on the Diocese’s property. Being American, we three are unable to drink the tap water and therefore consume a ton of bottled water. We do have a water filter and boil much of our tap water before consumption, but on-the-go or while travelling plastic water bottles seem to clutter our bags and car seats in abundance. We’ve already got a sizeable collection in the shed, but it takes a lot of bricks to build even a small latrine. Thus, the bottle collection! 2. Paper Collection: Another group of mzungus in town are collecting used papers with which they are remaking into new paper for homemade journals. 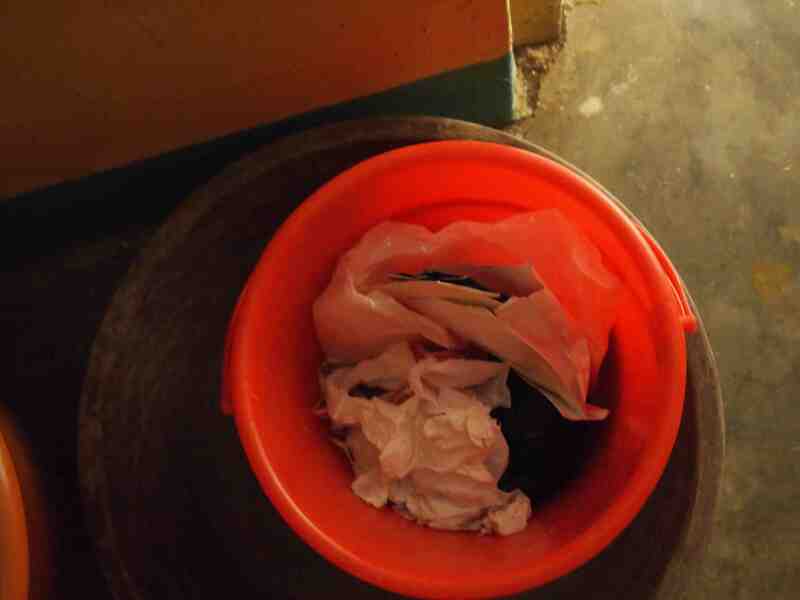 Thus, we’ve begun saving our paper to donate to them, and when we weren’t doing that we recycled the papers we had. 4. Compost: Also pretty self-explanatory, we compost all of our mango skins, tea bags, and food scraps to enrich the soil in the garden. 5.Burning: once we’ve filled the orange bin with trash we absolutely cannot reuse, repair, or otherwise repurpose, we make a pile of the garbage behind the latrine and light it ablaze. And, as we have recently learned, even our burned garbage can be of use! For the solar cooker/oven project (discussed here) one of the materials necessary is black paint. Since we want to make the cooker as organically and cheaply as possible, we researched ways to make black paint. Turns out a blend of soot and wheat paste (aka flour and water) works superbly to make natural black paint. Voilà! Even our burned trash can be re-used. Now, I realize as I type all of this, I sound like one of those exhaustive Greenie Beenies who declare their earthy-crunchy lifestyle to be the lifeline of the planet. I claim no such status- even as I was typing I turned to Thera to express how pretentious I sounded in my head. The reality is, we really have no choice. We try to burn as little as possible, if nothing more than we are blessed with enough money to live by in our cozy house. We save all of our juice boxes, bags that once held crisps and biscuits, and other containers both for their metallic lining for- what else- the solar cooker. But even when we aren’t storing up for that, we put out a box of all these container for people to take and use themselves; this is the level of resourcefulness and poverty we encounter every day. When that lack of material wealth is made viscerally real every single day, how could we only consume and throw out without a second thought? And the thing is, being here even for this brief amount of time (today is my three week anniversary!) has already made me promise to myself that when I return I will consume less and repurpose, recycle, and reuse more frequently. Just because we live in a house run on solar power in the middle of Karamoja should not be an excuse to constrict renewable resources once back in the states. best thing in my life right now: my burn is almost entirely healed. i shall have an enormous pink scar for some time- but hey, it’s one helluva tale to tell. and, you know, harry potter has a swank scar with a splendid story!